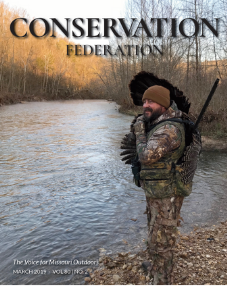 The Charles P. Bell Conservation Scholarships are sponsored by the Conservation Foundation of Missouri Charitable Trust and the Conservation Federation of Missouri. The scholarships are named for Charles P. Bell, a past president of the CFM, whose family provided major funding for this program. Eight scholarships are awarded each year. There is one graduate level scholarship in the amount of $600, one undergraduate scholarship in the amount of $500, and six scholarships for elementary, high school or youth group projects each in the amount of $250. The graduate and undergraduate applicants must be enrolled in a field of study related to management of natural resources, specifically fish, wildlife, forest, soil, and water. Applicants must be Missouri residents, and those applicants enrolled in Missouri schools will be given preference. Undergraduate applicants must have earned at least 60 hours of college credit. The following information must be submitted with each application. Applicants must provide three letters of recommendation with the application (may be teachers, employers, or other persons acquainted but not related to you). Applicants must list community and school activities. Undergraduate applicants must provide a copy of his/her high school transcript and college transcript; Graduate applicants must provide a copy of his/her college transcript. Applicant should give a profile of his/her work experience, if applicable. Applicant should make a statement of need and explain how he/she intends to use the scholarship. Applicants must provide a copy of an acceptance letter to the university or graduate school (as applicable) he/she will be attending. Elementary, High School, Youth Group scholarships will be awarded to Missouri elementary or high school classes or youth groups who have ongoing or proposed projects related to natural resource conservation, especially those which entail education and physical involvement in the protection of the natural environment. Applicants must include the names of the teacher, class or group, and school, and addresses for the teacher and school should also be included. The applicants must describe the objectives of and procedures used in the project. An essay with the theme of how the project will benefit the community should also be included. The application must have the signature and title of a school superintendent or principal. Undergraduate – Undergraduate Scholarship Form or apply online here. Graduate – Graduate Scholarship Form or apply online here. For all scholarships, applications and letters of recommendations must be received by January 31. If you have questions about the scholarships, email us. Originally named the James D. Chambers Memorial Scholarship Fund, this scholarship was established in 1994 following the untimely passing of James (Jim) Chambers, the son of avid conservationist Glenn Chambers of Columbia, Missouri. Jim was a brilliant student and exceptionally fine musician, having performed as a concert pianist at Carnegie Hall, and solo tenor singer in the London Opera House. Jim’s love for the outdoors and nature paralleled his enthusiasm for music. He enjoyed hunting, fishing, and camping with his family. He also earned the Eagle Scout Award from the Boy Scouts of America with gold and silver palms. In 2017, Jim’s father, Glenn lost his courageous battle with cancer. Glenn was a nationally recognized conservationist and was honored in many ways over the course of his lifetime. Among his many credits was the William T. Hornady Gold Medal from the Boy Scouts of America – a rare lifetime achievement award given to a very small number of people historically, including Theodore Roosevelt and Aldo Leopold. Glenn was also recipient of the Ducks Unlimited Distinguished Service Award, and the Master Conservationist Award by the Missouri Department of Conservation, to name only a few of his honors. After Glenn’s death, the name of the scholarship was changed to the Chambers Family Memorial Scholarship as a way to honor both father and son. This is a Conservation Federation of Missouri (CFM) sponsored scholarship. In 2018, a complimentary scholarship was created by the Missouri Conservation Heritage Foundation (MCHF). As funds allow, a second MCHF scholarship may also be awarded targeting senior undergraduates. For 2019, two scholarships will be awarded: A $1,000 graduate award and a $500 senior undergraduate award. Scholarship awards will be given in March 2019 at the CFM Convention. Who may apply – This scholarship is awarded annually to a graduate or senior undergraduate student majoring in wildlife biology/ecology, or natural resources conservation at a Missouri college or university. The scholarship is designed to recognize excellence in academics, leadership and conservation education. An essay (no longer than 2 pages) describing the graduate student’s research or special project work and how it will or has benefited natural resource conservation, or the senior undergraduate student’s academic/professional goals and reasons behind these goals. A current resume, including anticipated graduation date. Two letters of recommendation from natural resource professionals. Application materials should be sent electronically (either MS Word or PDF) by January 31 to: (Micaela Haymaker, mhaymaker@confedmo.org). Incomplete or late applications will not be considered. Questions may be directed to: (Micaela Haymaker, mhaymaker@confedmo.org, 573-634-2322, ext. 101); Conservation Federation of Missouri, 728 West Main, Jefferson City, MO 65101. The Conservation Federation of Missouri (CFM) is pleased to announce that applications are now being accepted for the Kirkham Family CFM Scholarship. This $1,000 scholarship will be awarded to an upperclassman or graduate student who is currently a member of CFM (or whose family is a member of CFM) and is studying big game at an accredited college or university. This scholarship is intended to support the career development of a wildlife biologist. Applicants must be enrolled at a Missouri college or university. Judd Kirkham was a Conservation Federation of Missouri Board Member, Past President and Life Member. Applicant must be a Missouri resident. Applicant must be an upperclassman or graduate student. Applicant must be studying big game. Applicant must include an official copy of their college/university transcript. Applicant must list community or school activities. Applicant should give a profile of their work experience (resume), if applicable. Applicant should make a statement of need to explain how the scholarship is intended to be used. Amount of scholarship: $1,000.00. There will be one scholarship awarded annually. Applications and all other materials needed must be received by January 31. If you have questions about the scholarship, email us. The Foundation’s Ed Stegner Natural Resource Scholarships were established to provide major financial aid to encourage and assist students in five areas of natural resource management: fisheries, forestry, wildlife, parks and recreation and soil and water conservation. Funding for this scholarship program was provided to the Foundation by Ed Stegner of Pilot Grove, Missouri. A Master Conservationist, Stegner is the former executive director of the Conservation Federation of Missouri, and is especially known for his leadership role in the passage of the 1/8th of 1% conservation sales tax to fund the Conservation Department’s expanded program, Design for Conservation. Applicants must be Missouri residents from any county or city in the state who are or plan to be enrolled as an undergraduate at a Missouri college or university in the chosen discipline of study. Preference will be given to individuals with a demonstrated financial need. Applications and supporting materials must be submitted by January 31. Apply for a scholarship online or complete and submit the above form to the Conservation Foundation of Missouri Charitable Trust, 728 W. Main, Jefferson City, MO 65101-1559 by January 31. The Foundation’s Carl Morrow Graduate Scholarships in Natural Resources provides major financial aid to encourage and assist Missouri graduate students in five areas of natural resource management: Fisheries, Forestry, Wildlife, Parks and Recreation and Soil and Water Conservation. Carl Morrow, Vice-President of Missouri Power and Light in Jefferson City, Missouri, was a dedicated and long-time citizen conservationist who served in many volunteer positions with the Conservation Federation of Missouri and as the first Chairman of the Conservation Foundation of Missouri Charitable Trust. Through his efforts the Foundation became a firmly established and financially viable public trust. The Foundation honors his memory with this graduate scholarship program. The Foundation’s Carl Morrow Graduate Scholarships are a joint venture with the professional societies that relate to five different resource areas, specifically the Missouri chapters of the Wildlife Society, American Fisheries Society, Society of American Foresters, Missouri Parks and Recreation Association and the Show-Me Chapter of the Soil and Water Conservation Society. These groups provide committees that select the recipients in their respective categories. Once selected, the scholarship recipients are notified and each is presented a check in the amount of $1,000.00. Applicants must be Missouri residents from any county or city in the state who are or plan to be enrolled as a graduate student at a Missouri college or university in the chosen discipline of study. Preference may be given to individuals who have previously received one of the Foundation’s undergraduate scholarships. Apply online here or print and submit application and supporting materials to the address below by January 31. The Conservation Foundation’s Minority Natural Resource Scholarship has been established to provide financial aid to encourage and assist minority students who are interested in a career in natural resource management, especially in the fields of Fisheries, Wildlife, Forestry, Parks and Recreation and Soil or Water Conservation. The Foundation’s goal is ultimately to increase cultural diversity in Missouri’s state and federal natural resource agencies. Applicants for this $1,000 scholarship must have been accepted and enrolled as an undergraduate in a Missouri college or university and should have already selected a major in a natural resource field. Preference may be given to individuals with a demonstrated financial need. Application and supporting materials must be submitted no later than January 31. The procedure and application form may be downloaded from the link below. A committee of the Foundation will meet in February of each year and select the recipient from among the applicants who meet the criteria and have submitted the requested forms. Complete the provided online application to apply for the scholarship. If you have any questions about the scholarship, email us.